The international chemistry community lost a pioneer when Jacques-Emile Dubois died of cancer in Paris on 2 April 2005. Dubois was known for his advances in handling chemical structural information. Prof. Dubois received many civic and scientific awards, including the French Resistance Medal, French Legion of Honour, Ramsay Fellowship in London, and Herman Skolnik Award of the ACS Division of Chemical Information. He was a member of many French scientific bodies and director and member of numerous academic research institutes and laboratories. He also held a number of responsible positions within the French government, including scientific advisor in the Ministry of National Education, deputy director of Higher Education, and director of Research for Defense. Dubois chaired the IUPAC Interdivisional Committee on Machine Documentation in the Chemical Field (1969–1977) and was a member of the IUPAC Working Party on NMR Computerized Data Banks in the late 1980s and early 1990s. He was president (1994–1998) of CODATA (Committee on Data for Science and Technology) of the International Council of Scientific Unions. Perhaps his greatest contribution to science, and more specifically to chemical information science and technology, was the invention of DARC (Documentation and Automated Research of Correlations), a topological chemical information system conceived after World War II, when the amount of published chemical information dramatically increased and needed to be appropriately coded, classified, organized, and retrievable to answer specific queries. Computer hardware and software, however limited and primitive, became available and it was obvious to a forward-thinking individual such as Dubois that they needed to be harnessed to counteract the information crisis. The DARC system, conceived in the early 1960s, became operational in 1977 as part of EURECAS, the online chemical substructure search service utilizing CAS files. Dubois authored over 1000 articles and presentations in fast kinetics, thermodynamics, and chemical information. He also edited a number of scientific books, primarily in the field of scientific and technological information. 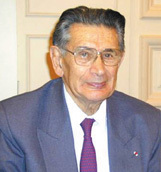 He obtained a Ph.D. in Physical Sciences in 1947 in Grenoble, and began his scientific career as an advisor to the cultural attaché of the French Embassy in London. The academic path included readership in chemistry at the University of Grenoble, founding professorship of the Trilingual Chemistry Institute at the University of Saar, and chair of physical and organic chemistry at the University of Paris. He was respected by his colleagues, students, and friends for his competence in numerous scientific fields, his promotion of multidisciplinary endeavors, and his pioneering work in developing modern tools in chemical information science.